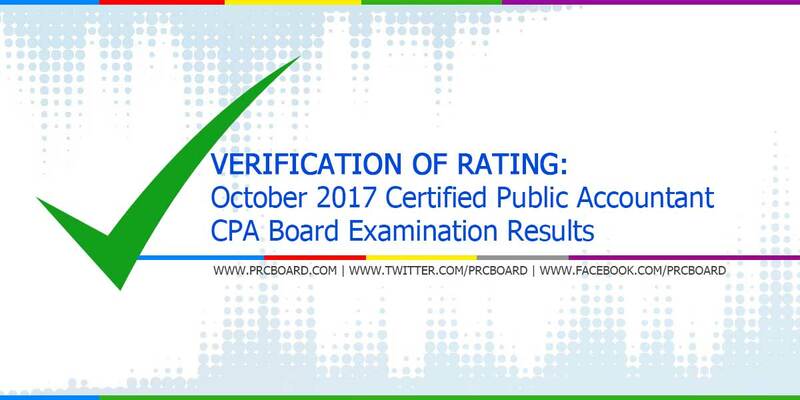 MANILA, Philippines - The verification of ratings and test results for the October 2017 Certified Public Accountant (CPA) board exams given by PRC Board of Accountancy will be available online few working days after the posting of results. Passers of October 2017 CPA board exams are advised that the Professional Regulation Commission has fully utilized the online registration for issuance of Professional Identification Card and Certificate of Registration in Manila. The date of registration are provided in the main page together with official results. To keep updated on related news and announcements about October 2017 Certified Public Accountant licensure exams, we advise our readers to visit PRC official website or follow us at our social media accounts via Facebook and Twitter. When can you upload conditional passers? It would be greatly appreciated if you can provide the list simultaneous with the publication of the passers. The logic is simple for this, PRC will not leave hundreds of expectant hanging and anxious or restless. thanks God at ksma anak q s condi James charles ortiz toledana isang subject n lng po!!! !